So, I'm going to come right out and say it: unless you are an extremely laidback parent, you probably aren't going to want your kids to read the webcomic I'm covering today. I mean, it's one of those things where I highly recommend this to all adults, but parental interpretations of what is and is not appropriate for children can be intense and a little terrifying, so I'd rather get it right out there that this very well may not be appropriate for your child. That's okay. Then again, that does beg the question of why we're talking about this at all. Why discuss a probably-too-mature-for-your-kids story in my column specifically about kids' media? Well, because I am of the opinion, and I totally understand if you disagree, that sometimes it's good and healthy and important to let your kids read stuff that isn't appropriate for them. 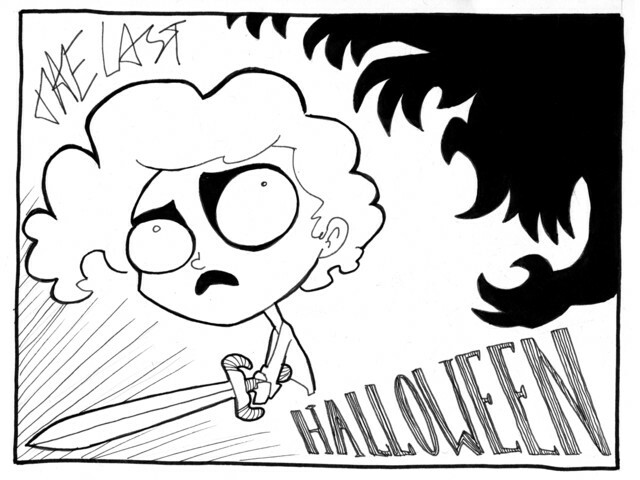 The Last Halloween is a webcomic by artist Abby Howard who you might know as the brilliant mind behind Junior Scientist Power Hour or her appearance on the indie reality show Strip Search (which was a Penny Arcade sponsored reality show about finding the next great webcomic artist). The Last Halloween is her first real foray into a longer, scripted narrative, and it's really really good. I feel the need to emphasize that. It's fantastic. The story follows ordinary child Mona, who's nine I think, on Halloween. Her father leaves for a party and Mona is left all alone at home. Not a huge deal in general, but this particular Halloween it's sort of a problem. Mona is alone in the house when all of a sudden monsters appear everywhere and start killing people all over the place. Mona freaks out - like anybody would - and runs for her life. In her running and trying to find her dad, she eventually runs into a motley gang of monsters and otherwise strange "people". The group, which consists of a preteen vampire (Nosferatu-type, I think), an animated porcelain doll, and a zombie. And by run-into, I mean that she comes upon them doing some light graverobbing as she's in the process of running to the police station for help. At first Mona, who possesses a healthy skepticism and a lot more logic than most protagonists, has no desire to go anywhere with this group of "child-like creatures". But when Robert, the doll, points out that she can either go with them and maybe get murdered or stay where she is and almost definitely get murdered, Mona agrees to tag along. And it's a good thing too (for our story - not so much for Mona). This is how our story starts. The monsters, it turns out, have all risen because their controller, the Phagocyte, is dead. The new Phagocyte is missing and therefore can't take control and keep the monsters in the shadow realm where the belong. So, instead, all the monsters are out on the surface, walking the earth and killing people. If the monsters kill "their" human - the human with whom they are inextricably linked - then they can live forever. If they don't, then they will die when their human dies. There's a lot of death going on, all of it very artistically and gruesomely represented in the art. 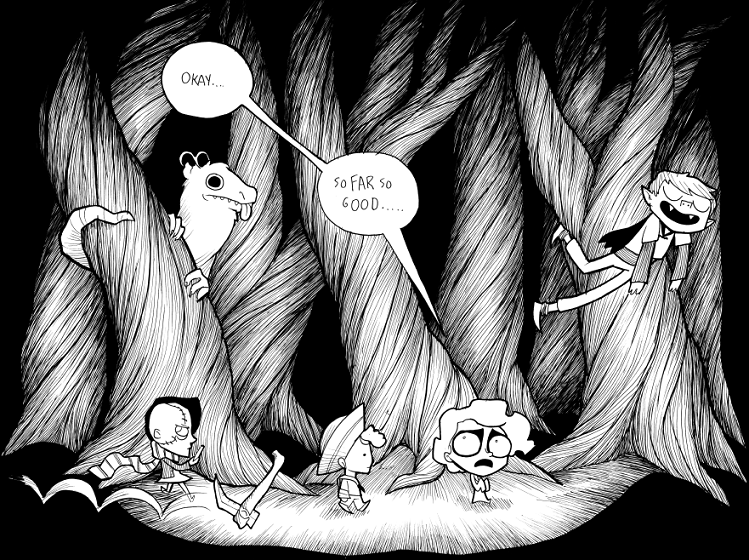 Mona and her "friends" end up on a quest to find the new Phagocyte and help him escape from whoever is keeping him from assuming his duties. And as the sole human on the quest, Mona gets her own special weapon and a whole thing about being the chosen one and having a destiny. Ultimately, though, what we really learn is that Mona was in the wrong place at the wrong time. She's not the most qualified or best suited to save humanity. She's a little girl. But she's going to try anyway. The story isn't actually over yet as of this writing. Howard hasn't stated how far we are into the plot, but it feels like we're somewhere in the middle. Act two, if you will. There are six chapters already written, and all of them are excellent. Terrifying, hilarious, and frequently disgusting, and excellent. The reason I bring up The Last Halloween in terms of kids' media is because it's a story that walks the fine line of being appropriate for kids or not. I mean, technically speaking there's nothing in it that's not appropriate for kids. 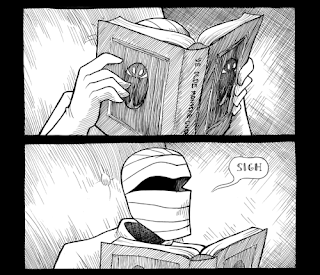 Mona's relationship with her dad might put some people off - he dresses up in her dead mother's clothes sometimes because he "hates for them to go to waste" and they seem to have communication problems - and there is absolutely no getting past how much Howard really likes writing the gross stuff. But none of it is actually something you would have a hard time explaining to your child. It's just scary. That's the main reason it's inappropriate for kids and also the main reason why I think it might be worth it to let some kids read it anyway. See, The Last Halloween is very very scary but in a way that I think kids can easily process. 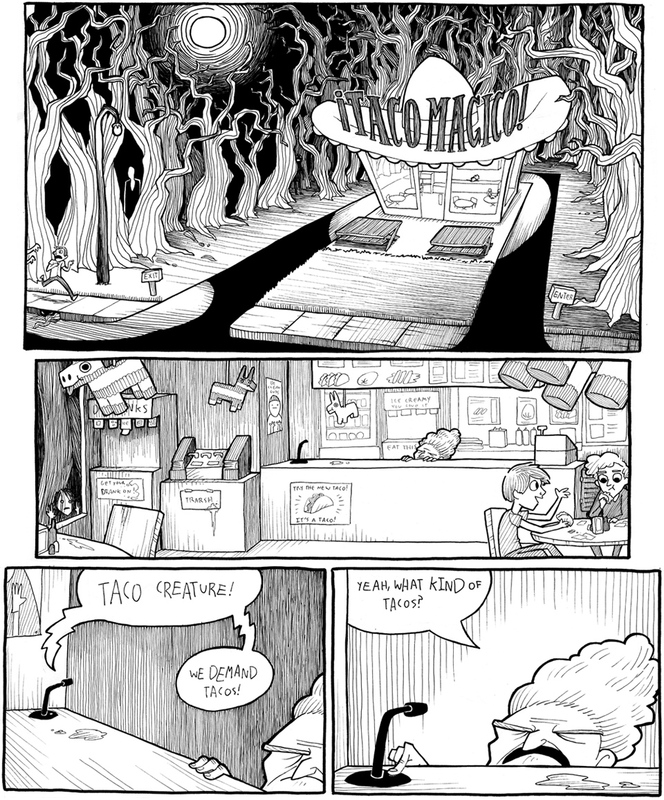 It's scary because there are monsters and the monsters do terrible things. It's scary because Mona is a child and the only one who seems to know what's happening, and so it's frightening when no one will listen to her or believe what she tells them. It's scary to see all these images of gross horror, but it's scary in a straight-forward, simple kind of way. There's a monster in your house that wants to eat you? Simple and frightening and weirdly wholesome. The value of this is that reading a scary story with such easily externalized monsters helps kids to learn to process fear in a healthy way. Some psychologists have even theorized that this is why kids crave ghost stories, teenagers are the most likely to watch horror films, and the older you get the less you want to have the pants scared off you. As young people we are instinctively searching for the way to process fear and in order to learn that we need to experience it. Only because we're people, we don't want to actively put ourselves in dangerous situations that would evoke a natural fear response (well, most of us don't anyway). So the most natural solution is simulated fear. Using our empathy and imagination to develop scary situations and then figure out how to deal with fear emotionally. But now that I'm an adult, my fears are much less obvious and tangible. I fear that I have hurt someone so badly that I left irreparable wounds on their heart. I fear that my loved ones will die before their time. I fear that my life will go to waste and I'll never use the gifts I've been given to the right purpose or to their fullest potential. I fear that my car will break down on the highway and I'll die in a carwreck, sure, but that fear is much smaller compared to the fear that I will get in a small accident and cause a lot of trouble and hassle for a lot of people, cause some grief, and make life very difficult for a number of good people. Maybe that's just me and I'm incredibly odd. But I don't think so. As we get older, the things we fear switch from external circumstances and become internalized. Fear of failure, fear of public speaking, fear of not leaving a mark on this world... Those are all incredibly common adult fears and they're all ultimately about us. They're sort of post-graduate fears in a way. In order to deal with them properly, you need some training in dealing with your average baseline fears. And that's where stories like The Last Halloween come in. I think we need to learn how to be afraid. And I think that in a lot of ways, our job as guardians and stewards of the next generation is teach them how to be afraid in a healthy and meaningful way. Because these kids are going to be afraid. There is absolutely no way around that. No human lives a life completely devoid of fear. It's part of who we are. By letting kids see a scary story or a horror movie or go on a haunted hayride or something, we're giving them the opportunity to know themselves better. To get a handle on their fear. Obviously each kid is going to differ in their ability to handle scary stuff. I personally was totally fine with ghosts and monsters and anything obviously inhuman as a kid, but freaked out over any form of body horror (like, say, bloody teeth - they still make my stomach squiggle). Lots of people are very different. It's a matter of taste and personality in most cases. And it's a very individual thing as well, deciding when a child is old and mature enough to start learning how to process fear. That's another part of it. But I think it is something that we should pay attention to. Just like all their other emotions, fear is a healthy and reasonable response the world sometimes. It's necessary, not an accident. Learning how to fear healthily is a big part of our lives. As for The Last Halloween, it might not be your cup of tea. That's totally cool. But for my money it's a great gateway drug to fear. The heroine, Mona, is someone that kids can look at and identify with. She's a girl who is very scared and very upset and who cries sometimes, but who then wipes away her tears and goes off to do the brave thing anyway. She's afraid and she acknowledges her fear, and she handles it. That's a good example. That's worth appreciating. ...Even if it's not, strictly speaking, "appropriate".